This information applies to British Columbia, Canada. Last reviewed for legal accuracy by Alison Ward in September 2018. An exception to the criminal rate of interest laws in Canada, payday loans are short-term, high-interest loans for $1,500 or less. Client has taken out a payday loan and wants to know their rights. Client wants to cancel a payday loan. Certain finance companies make small, short-term, high-interest loans that go by a variety of names: payday loans, cash advance loans, post-dated cheque loans, for example. Typically, the borrower writes a personal cheque, post-dated by two weeks and payable to the lender for the amount they wish to borrow plus a fee. The company then gives the borrower the amount of the cheque minus the fee. In the past, these loans were made on such terms that once all the interest, fees and charges were factored in, the result was often an effective rate of interest exceeding the maximum rate of 60% per year set by section 347 of the Criminal Code (see the section on Interest and the Cost of Borrowing Money). Because the courts will generally not enforce an illegal contract term, the lenders had trouble enforcing the loans. The criminal justice system in British Columbia was not used to curtail payday lending, possibly for fear of driving borrowers into the hands of loan sharks. Consequently, payday lenders used to operate in a legal grey zone. terms of not more than 62 days. British Columbia regulates payday lending in Part 6.1 (Payday Loans) of the Business Practices and Consumer Protection Act and the Payday Loans Regulation. In addition, if the borrower can’t repay the payday loan on time, the lender can add extra charges to the loan. They can charge interest at 30% per year on any amount outstanding, plus a one-time $20 fee for any dishonoured cheque or pre-authorized debit. 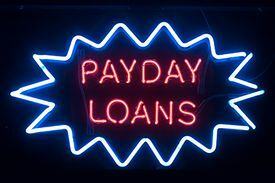 A payday loan cannot be for more than 50% of the borrower’s net pay over the term of the loan. A loan agreement cannot require repayment before the borrower’s next payday. charge any fee for prepayment. Section 112.10 of the Business Practices and Consumer Protection Act sets out remedies if a payday lender contravenes these provisions. For example, if a lender grants a rollover, the borrower is not liable to pay the lender any amount that exceeds the principal of the loan. If the lender charges any amount they are not permitted to charge, the borrower is not liable to pay the excess. If the borrower has paid any prohibited amount, they are entitled to a refund of all monies paid in excess of the principal of the loan. personal information from a borrower for any purpose other than offering a payday loan. a statement that Consumer Protection BC may be contacted for information on requirements relating to payday loans. The lender must review with the borrower and have them initial the clauses regarding the cost of credit, annual percentage rate, and cancellation rights. completing the cancellation notice, which the lender must give to the borrower at the time the loan agreement is signed. the lender does not give the borrower a cancellation form. Many payday lenders also cash government cheques for people. As of September 1, 2018, the Business Practices and Consumer Protection Act and Government Cheque Cashing Regulation cap the fees that can be charged to cash a “government assistance cheque”, such as an income assistance or disability assistance cheque from the provincial welfare ministry. Fees for cashing a government assistance cheque cannot be more than $2 plus 1% of the amount of the cheque, up to a maximum fee of $10. It is an offence to charge more than that. If someone pays more than the allowed fee to get a cheque cashed, they are entitled to a refund of 100% of the fee they paid. Obtain a copy of the loan agreement and determine whether or not a cancellation form was provided. Find out from the client the dates and amounts of any payments made, and whether or not they have given the lender any undated or post-dated cheques, assignments of wages, personal property, or transfer papers for personal property. If the client wants to cancel the loan and can raise the funds to do so, consider whether they can make use of the cancellation provisions. If the lender has made a rollover loan, discounted the initial advance, or charged an illegal or excessive amount, inform the client that they are responsible only for the principal amounts actually extended and can demand an immediate refund. If no refund is given, the most practical step is probably to report the matter to Consumer Protection BC. You should also consider reporting the matter to Consumer Protection BC if the lender has contravened the Business Practices and Consumer Protection Act in any other way. Consumer Protection BC can impose administrative fines or revoke licences if a lender repeatedly breaches the Act. If the client has suffered damages as a result of a breach of the Act, they may also wish to consider bringing a lawsuit against a lender under section 171 of the Act. See also People’s Law School’s pages on payday loans, the Canadian Consumer Handbook from the federal government’s Office of Consumer Affairs, the chapter “Consumer Protection” from the manual used by the UBC Law Students’ Legal Advice Program, and the resources on predatory lending issues in Canada from the Canadian Centre for Elder Law. This page was last edited on 16 November 2018, at 08:10.